Vintage Christmas includes instructions for making seven quilt projects, one wool applique project, two punch needle projects (see the Candy Cane Basket Punchneedle thread kit, below), and six ornament/craft projects. Soft cover. 36 pages. Vintage Christmas brings you the lighter side of Christmas, with the nineteenth century pairing of brown and pink, and the added sparkle of mica and glitter. 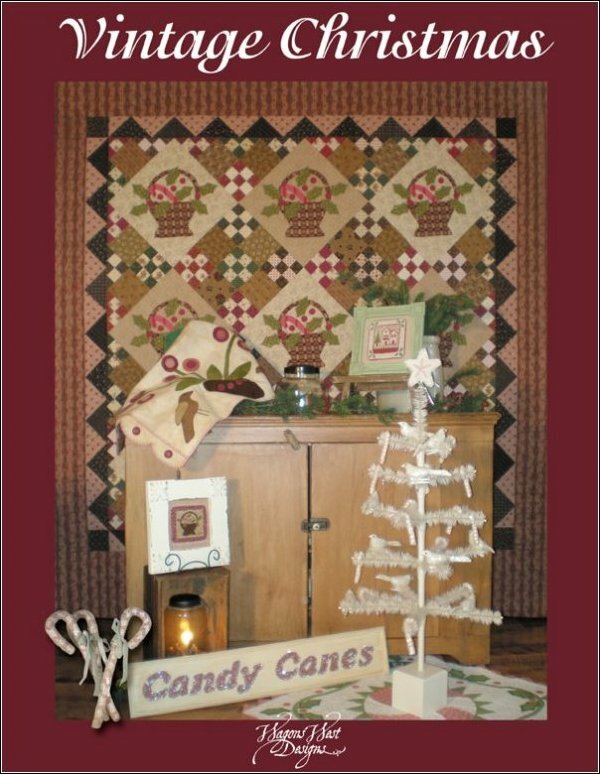 The book includes instructions to make pieced and appliqued quilts such as Candy Cane Nine Patch (on the cover) Peppermint and Holly (pictured above), Peppermint and Holly Table Mat, Sweet Bouquet, and the pieced quilts Wish You Were Here, Peppermint Sticks, and the doll quilt, Kisses for Dolly (pictured above). There are 16 projects in all, including Christmas ornaments, wool applique (Pot of Flowers wool table mat, featured above), and two punch needle projects (see the Candy Cane Basket Punchneedle thread kit, below)!